The gorgeous colors from the Zoya Beach collection were all sitting in a row, calling out to me... since I couldn't choose just one, I decided to go for four at once! After a base coat of Sally Hansen Xtreme White On, I marbled Zoya Wednesday, Shelby, Arizona and Tracie together using water marbling technique. When combined these colors totally make me think retro... so they needed some disco glam as well, haha. I topped it all off with a coat of Sally Hansen Hidden Treasure and Seche Vite and was good to go. These nails were fun and bright and I really enjoyed them! Finally made a bit of decent swatching time for myself the last week or so! I am still a smidge behind but almost caught up. 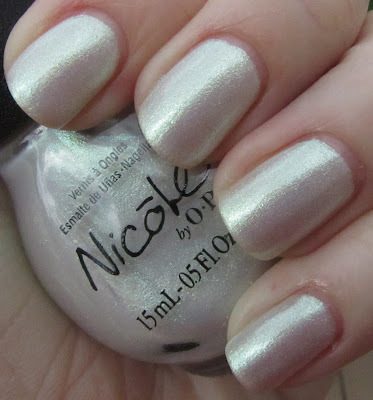 Here are six new shades from Nicole by OPI, the Wel-Kim to My World collection for Spring 2012. As always, swatches shown no base coat, with top coat. This polish is a slightly off-white creme with the slightest touch of rosy pink. I really like it as an alternative to super bright white cremes, but I found it to be just a bit tacky and streaky on application - whites are always a bit tough. However it evened out nicely with three coats. Yellowish beige creme. I think this has a bit too much yellow to look quite right with my skin tone perhaps? I have seen it looking pretty nice on some other people though. Smooth application, three coats. Shimmery silver-white with a sort of opalescent glow. This one has some duochrome in the bottle, which is not quite as apparent on the nails and totally absent in pictures. This took three thin coats for full opacity as well. This glitter top coat is full of gorgeous golden iridescent small glitter particles. This is one coat over Up and Kim-ing Pink, but it would look great over pretty much any shade. Yay, a blue! This is a periwinkle blue shimmer which took three coats to reach opacity. 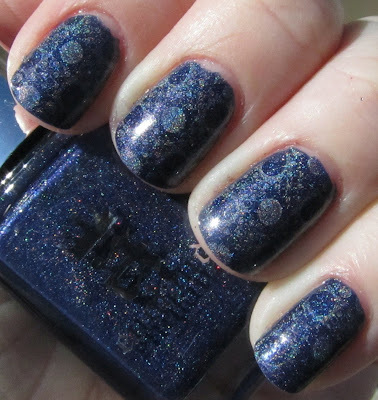 This kind of reminds me a bit of I Don't Give a Rotterdam from OPI Holland, I may have to do a comparison soon. However I think it is a bit brighter. 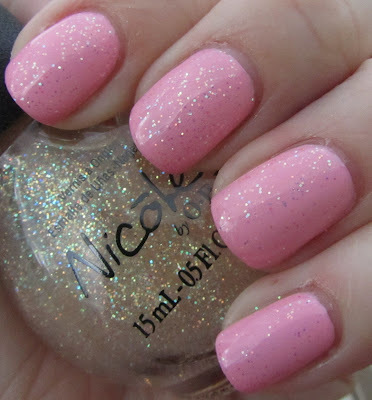 More Nicole by OPI Spring 2012 collections up later this week! Maine Attraction + Giveaway Winner! First up, some nails - I got this gorgeous blue from Ulta awhile back with rewards points, so it was free - always nice! It is a really gorgeous and fairly unique shade of blue. This is two coats of Ulta Maine Attraction with stamping using Konad White and plate RA-109. Loved the formula and the color on this one - I can never have too many blue polishes! The dusty quality to this kind of makes it feel antique... or something along those lines. :) The flowers gave it a really classy and elegant look. Started out with two coats of Zoya Shelby, followed by argyle stamping with Konad Special Black and plate m60. Added skulls with bundle monster plate BM-225 and Konad Special White. Decided to go matte with a top coat of China Glaze Matte Magic top coat. Really love the way these turned out! 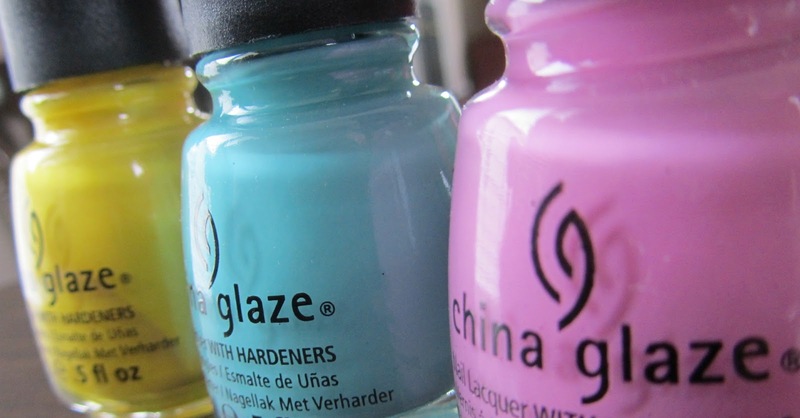 Two coats of China Glaze Stone Cold from their Capitol Colors Hunger Games collection. Gorgeous dark gray/black matte polish. As with all mattes dries super fast so apply quickly or it can get streaky. I'm not usually into blacks like this but the matte finish makes it totally awesome. Sorry for my absence last week. I've been dealing with some big life decisions lately and my blog (and my nails) kind of got left behind for the past week or so. I will try to get back on track with posting. 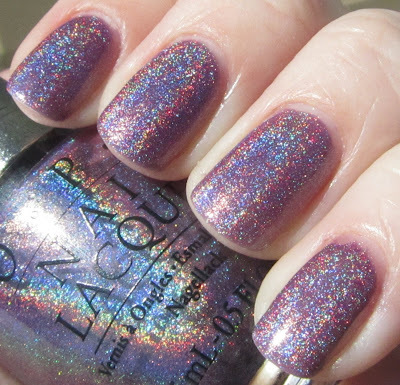 Today I want to share an absolutely stunning polish that my sister Becky was kind enough to let me borrow. OPI DS Original, three coats. This stunning holographic light purple puts every single holo I own to shame. I might steal it from Becky (watch out, B). Not much more to say about this beauty; here are a few more pictures. I have been rather on the busy side lately and haven't been able to swatch the new lovely summer collections from Zoya yet - I like to do collections (or at least halves of collections) all at once and preferably on a nice sunny day, to get consistent photos. However, this has not stopped be from wearing them! I have worn probably half of them by now either alone or with some design - they are actually the only thing I have worn since I got them last week (other than my Easter mani). 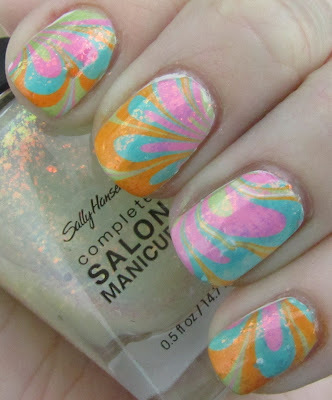 Here is a fun design using two of the "Surf" colors! 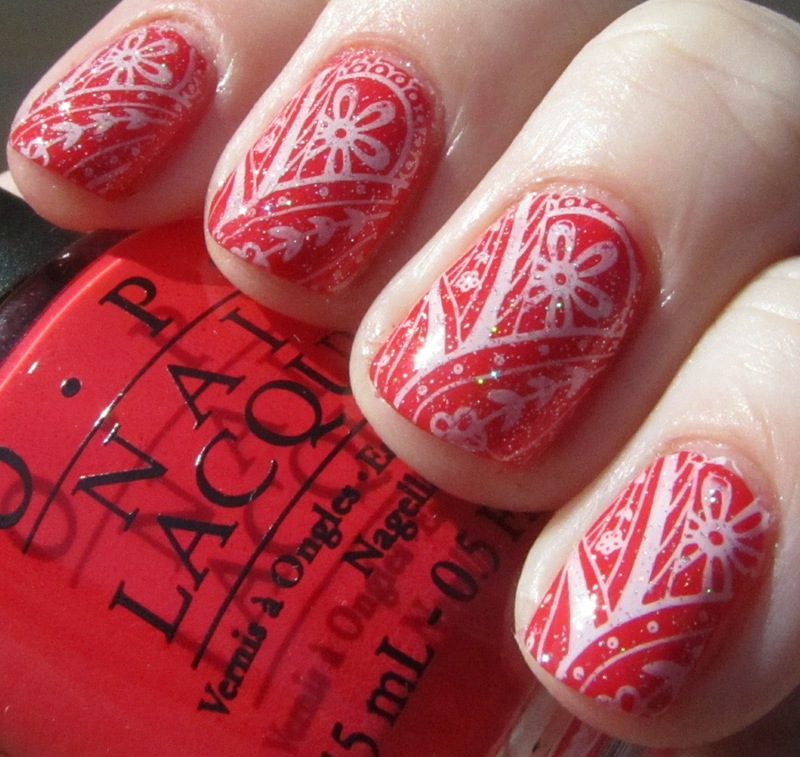 This is two coats of Zoya Zuza topped with stamping in Zoya Carly using Red Angel plate RA-105. I added a purple rhinestone to the center of one of the circles on the ring finger. 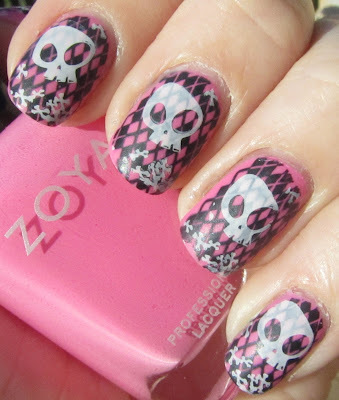 I love these colors together - such a fun and playful combination! For this mani I used the following colors, from thumb to pinky: China Glaze Re-Fresh Mint, Essie Lilacism, Orly Lemonade, China Glaze Kinetic Candy, and OPI Pink Friday. I used Konad Special White stamping polish and plates BM-211 (flowers) and m19 (tips) to add the designs. I topped each nail off with a coat of China Glaze Fairy Dust for a slight touch of holographic glitter and was done! Hope everybody has a fabulous Easter weekend! 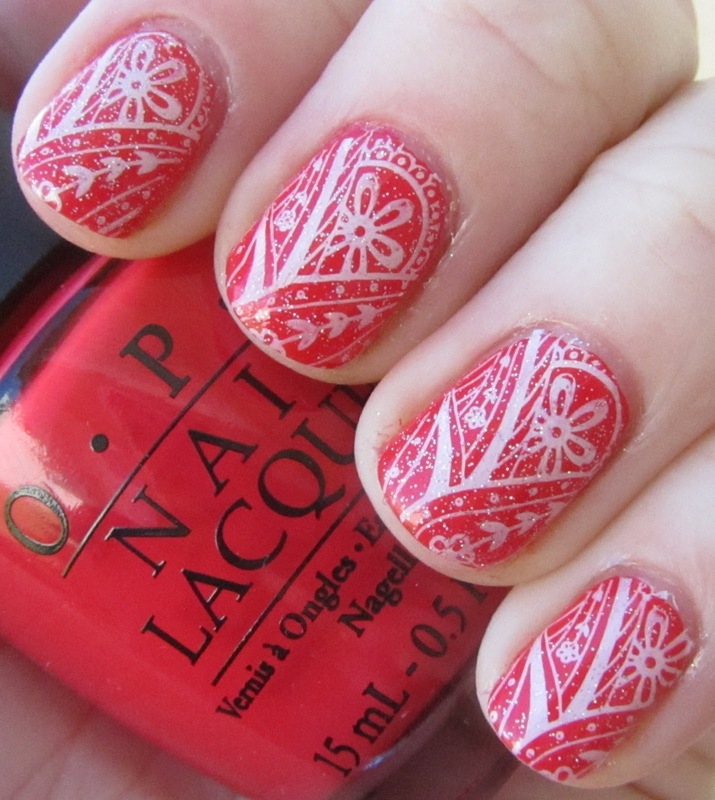 Two coats of OPI Red Lights Ahead... Where? 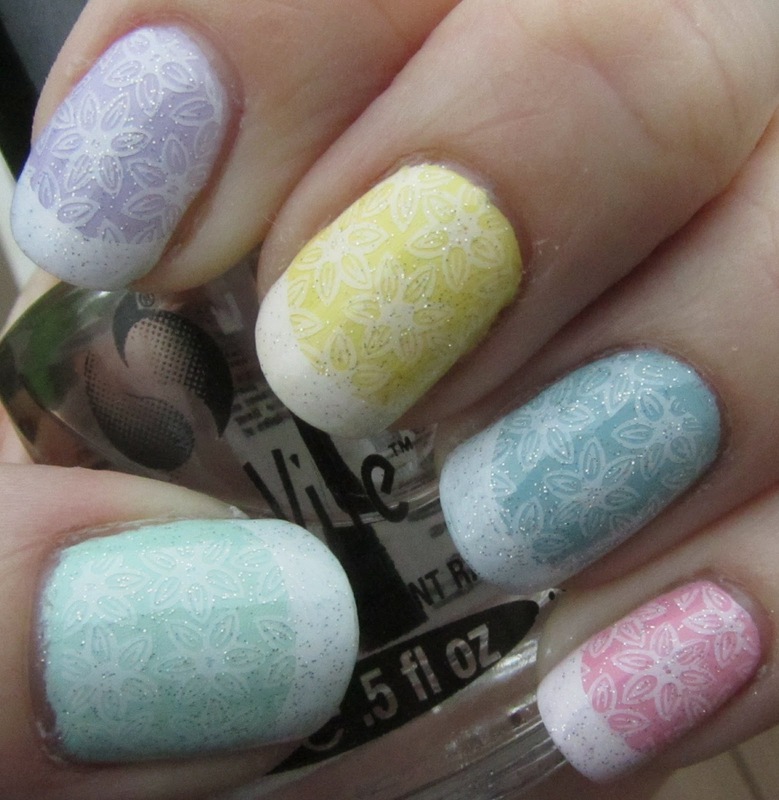 followed by stamping with Konad Special White and plate m60. 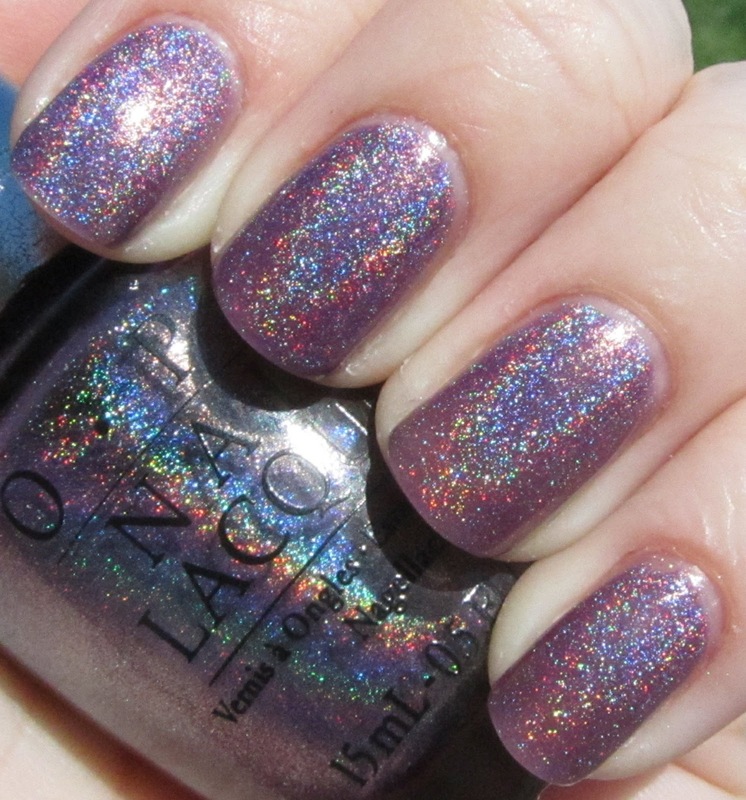 Finally topped off with a coat of China Glaze Fairy Dust to add a bit of holographic sparkle. Basic and fun! So ready for summer. Here is another gorgeous polish from a-England, the dark blue holographic Tristam! For these nails I used two coats of s-England Tristam, which applied beautifully and has a gorgeous holographic effect on its own. Then I stamped on some China Glaze OMG using plate RA-108. 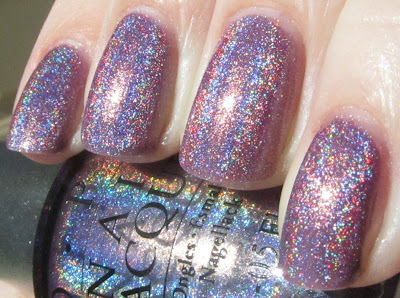 I pretty much loved everything about these nails - the color is gorgeous, I love the holo, and the pattern is really fun. I am definitely now a huge fan of a-England polishes!